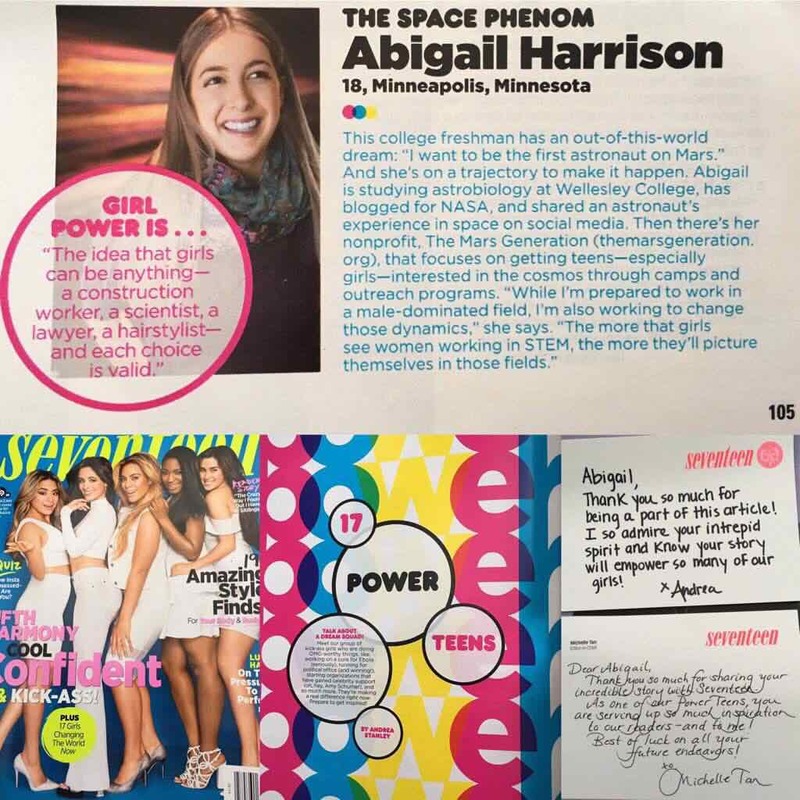 We are excited to announce that our founder and spokesperson Abigail Harrison, Astronaut Abby, has been selected as one of Seventeen Magazine’s 17 Power Teens for 2016. Abigail was featured with young women that include several activists, a politician, a professional skateboarder and many other amazing teens. The article is featured in the March 2016 issue of Seventeen Magazine. Not only does the article take about Abby’s own dreams to be the first person to Mars but also her outreach work and her founding of The Mars Generation including a mention of our website address and our mission. A great shout out to our organization that will hopefully inspire more girls and young women to get involved with STEM and The Mars Generation. We are thrilled to see a pop culture magazine such as Seventeen feature smart, strong, ambitious young women as role models and hope to see the trend continue. Thank you Abby for your great representation of our organization and Seventeen for choosing Abby as one of your 2016 Power Teens!